Tom Wier has reached a fork in the river. Wier, 25, of Snohomish won a national championship at the 2005 USA Wildwater Nationals last month on the Arkansas River in Salida, Colo. 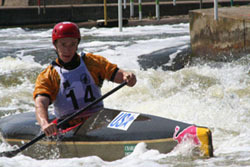 It was his fourth national crown, all since 2000, in the one-person canoe class of wildwater, or whitewater, paddling. Tom Wier, a personal trainer from Snohomish, has competed in wildwater races in eight foreign countries. Currently at the peak of his sport in the United States, Wier is mulling whether he is content dominating his sport domestically or if can find the time and money to take on the world. Similar to kayak and canoe events included in the Summer Olympics, wildwater paddling throws imposing Class 3-4 rapids into the mix and employs ultra-fast, extremely unstable vessels. Not currently part of the Olympics, wildwater racing still draws elite athletes who push the limits of strength, speed and timing. The sport that Wier first tried as a high school freshman in Boulder, Colo., has carried him across the planet. He has competed in England, Ireland, France, Italy, Austria, Germany, the Czech Republic, and Slovenia. "It's pretty incredible," Wier said of his paddling experiences. He has finished among the top 20 in a variety of international events, including an 11th-place effort in May at the World Cup in England. Now Wier must decide how far he wants to go. Money is the biggest hurdle for Wier, who works as a personal trainer at Allstar Fitness in Monroe. In order to compete with the world's elite paddlers, many of whom hail from Eastern Europe, Wier said he must train overseas. The idea is that consistently practicing head-to-head against the world's best competitors will boost Wier's ability. However, Wier, who pays all of his own paddling-related expenses, estimates each Euro trip costs between $3,000 and $3,500. He recently started to pursue local and national sponsorship. "If the U.S. can come up with some money for him to spend a season or two (in Europe), I think he could be in contention for a (World Cup) medal," said Rich Roehner of Bellingham, one of Wier's training partners. Andy Bridge of Sultan understands Wier's dilemma as well as anyone. Bridge is one of the most accomplished American wildwater racers in history. He won 10 national championships between 1986 and 1996, and made a major impact on the world scene. Bridge placed among the top three at the World Cup from 1990-92, including a world title in 1992. Bridge, who grew up in the Washington D.C. area and moved to Sultan in 2000, retired from international competition in 1993. Now 42, he put the rest of his life on hold for several years to find out how far he could go in paddling. "Those were awesome years," said Bridge, currently a product designer for Sultan-based Werner Paddles. "I wouldn't trade them for anything." Bridge made significant sacrifices during his commitment to the sport. He never had health insurance, couldn't save money due to travel costs and had to put off starting a family. "You can't live that lifestyle for ever," said Bridge, who now has three children. "It becomes personally challenging to try to put everything else in your life far enough behind that you can take it to the next level. I just sort of structured my life so that everything else became second." Wier is approaching a similar lifestyle. To reach his potential in a physically demanding sport, he has carefully molded his body. "Physically," Roehner said, "he's a rock." Wier has trained for paddling year-round since his sophomore year of high school. His most intense cycle is September through May, when he's on the water up to six times per week for one to two hours at a time. He also lifts weights as many as four times per week. "I think he definitely has the tools and the dedication," Roehner said of Wier. "It's just a question of time and money." Wier and his wife hope to eventually have children but they have agreed to wait until he's done racing. As Wier weighs his options, he has his most memorable national-championship effort fresh in his mind. On June 19, with both of his parents in attendance, Wier decisively won a national championship on the Arkansas River in Colorado. The location, where Wier once worked as a rafting guide, is about a four-hour drive from where he grew up. "It felt a little bit sweeter," Wier said of the victory, "because both my parents were there." So maybe Wier will go to Europe and challenge the world's best. Or maybe he'll decide that being a national champion is rewarding enough. Maybe he'll start a whitewater paddling program for children, an idea he's considered for awhile now. Either way, Bridge hopes Wier moves on free from regret, confident that he pushed himself as far as he could go. "The problem," Bridge said, "is if you don't go for it all the way ... you may be sitting in your rocker when you're 80 and asking 'What if?'"